Classic garden canopies use a Victorian post which gives a more traditional look. 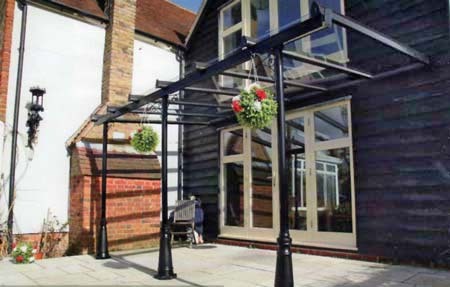 All classic canopies are made to order and are available in white, black, anthracite grey and Chartwell green. We also offer a colour match service to any RAL colour so your canopy can be matched to your house. 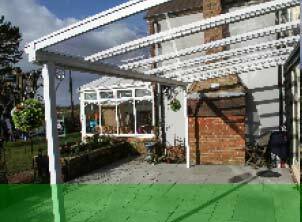 Our roof system allows you to enhance the look of your canopy by adding additional features. We have a wide range of extras such as ornate Victorian support posts and gallows brackets. We can paint roofs to match your house colour or we have a wide selection of maintenance-free wood effect foil finishes top choose from, also ask about our range of side screens for additional privacy.